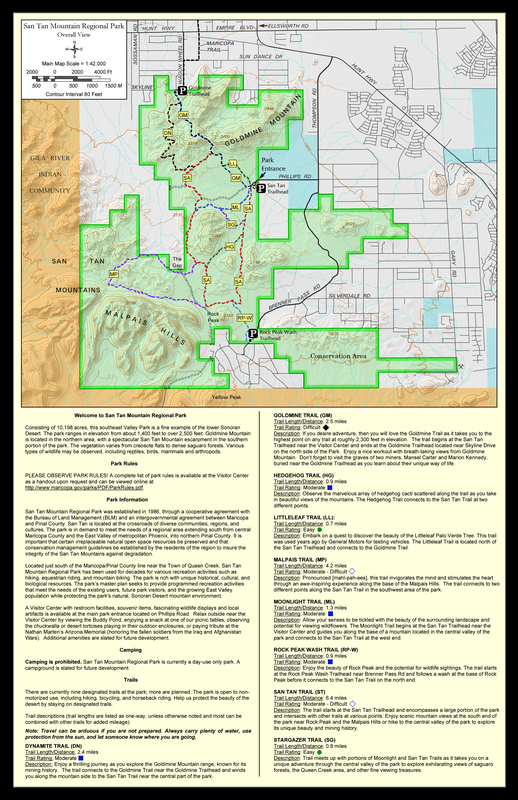 The Goldmine Trail is one of the more popular trails in the San Tan Mountain Regional Park. This is likely due to the elevation gain and rewarding views. 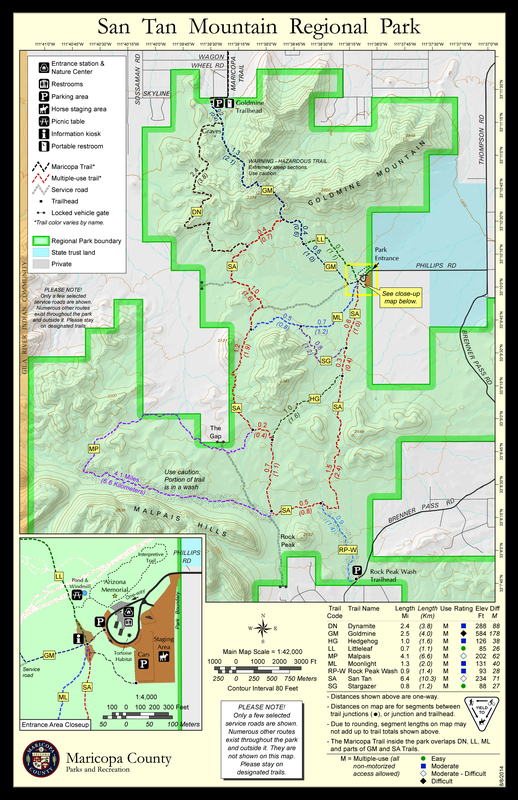 There are two ways to access this hike, one of which is from the Goldmine Trailhead located at the intersection of Skyline and Wagon Wheel roads on the North end of the park boundary. The second access point is via the larger visitors center located on the East end of the park at the end of Phillips road. If you're just looking for a quick workout, the Goldmine Trailhead is your best bet. However if you plan on exploring other parts of the park, you might consider accessing it from the visitors center. This trail description will be based from the visitor's center. To access the visitors center trailheads you need to either pay per vehicle, or you can opt to bike/walk in from outside the park entrance. Once inside the park, follow the signs to the trailheads. The Goldmine Trail starts out heading East from the visitors center along a wide, flat, dirt trail which is well marked and easy to follow. It soon curves North East and continues flat for about .7 mile until its junction with the Little Leaf Trail. From the junction with the Little Leaf Trail it continues North with a moderate incline for another .4 mile until its junction with the San Tan Trail. The trail continues North East from this point for another .5 mile as it steadily climbs to a saddle between peaks in Goldmine Mountain. At the saddle there are benches where you can rest and enjoy the view to the East. The trail continues along the ridge for another .25 mile to another resting point that presents views to the North and West. From here you can sigh at all the hustle and bustle going on in the Phoenix metro area, as you enjoy the peace and quite of the park. From the second view point, the trail descends the North West side of the mountain for a .75 mile before reaching the other Goldmine Trailhead on the North park boundary. This section of the trail is quite rocky and one should take care especially when descending. Near the North Goldmine Trailhead there is an interesting grave site where some prospectors were buried. The return route is the way you came unless you have a car shuttle at the opposite trailhead. The park visitors center has a nice memorial of the Arizona residents who lost their lives in Iraq and Afghanistan. For visitor center: From central Phoenix, take I-10 east to US 60 east. Exit Ellsworth Road south to Hunt Highway. Travel east on Hunt Highway to Thompson Road south. Turn west on Phillips Road to the San Tan Mountain Regional Park entrance.